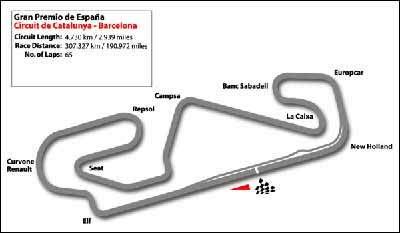 With Spain’s Alonso having won three GP’s on the trot, the Spanish GP is a sell-out this weekend. Hopefully we will see some more action, such as we saw in San Marino from Alonso and Schumacher (Michael, forget Ralf), which will make it interesting. The race is scheduled to start at 7 p.m. I believe (but check your local TV feed to be sure). What did we learn from the Imola Grand Prix? Well, the first thing we learned was never, never, never write off Michael Schumacher. He stuffed up his one lap qualifying, ends up 13th on the grid and comes second by half a gnat’s knee. Alonso (who did not put a foot wrong all weekend) deserved his third win of the season, but admitted that he was powerless against the Ferrari driver’s onslaught. A few more laps, after catching up with the back markers and he would have been relegated, just as Jenson Button was a few laps from home. The speed of the new Ferrari, in the hands of MS, was such that he was lapping one second a lap faster than anyone. 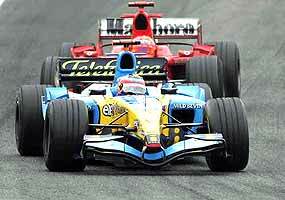 That is an enormous margin, so we could see a fight-back by Schumi for the 2005 crown. The following table shows it all. We also learned, after the race, that Jenson Button’s car was subjected to six hours of extra scrutineering, as it was suggested that he might have been running an underweight car for much of the race, but by (over)topping up with fuel at the last refueling pit stop, he would come in legal. The stewards of the meeting finally passed the car, but the Federation Internationale d’Automobile (the FIA and the supreme boss of world motor sport) has questioned the findings of their own stewards and there will be an appeal called by the FIA on May 4th, the results of which will mean a mighty ruckus in the Eff Wun camps, or alternatively much egg on the face for the FIA. Stay tuned. As a spectacle, the race was really just a high speed procession, with passing manoeuvres only coming about through mistakes by the driver in front (and I must say that Aussie Mark Webber in the Williams BMW had more than his fair share). Even Schumacher had problems in the first part of the race, sitting behind his little brother’s Toyota, apparently unable to pass. He leapfrogged from 12th to 3rd only during pit stops, when he got some clear air to let the new Ferrari demonstrate its speed. Any car enthusiast weeps when they return to Thailand and look at the plethora of pick-ups, after a spell in the UK, such as the two weeks I have just had. The Brits are definitely into small cars, both two and four door variants, and I honestly believe that the Thai government is heading in the right direction, trying to push the local motoring industry in that direction too. 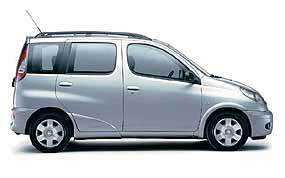 Selling well in the UK are GM’s babies, the Daewoo Matiz, and the differently badged Chevrolet Spark (the vehicle copied by SAIC in China and sold as the Chery QQ and subject to litigation by GM). In fact, I am led to believe that the General would be happy to phase out the Daewoo name altogether, and just use the Chevrolet moniker. The Ford Ka is another very small vehicle that would help lessen congestion on Thai roads, though its quirky styling might not make it all that popular. The 1 Series BMW has not sold in great numbers over there, with the price and that dreadful styling being two obvious reasons. However, BMW’s Mini range is a top seller over in the UK, despite the price tag. I did also spot a new 5 Series with the dreadful Bangle bottom that I actually liked. What they had done was to exaggerate the bum of the car even further, making the boot into a giant ‘whale tail’ a la Porsches in the mid 70’s. It worked! The French are still one of the top sellers in the UK, with the Renaults being very delectable - the new Laguna is fabulously styled, for example. 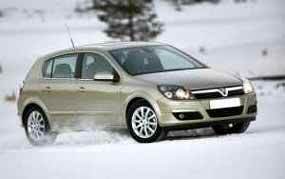 GM’s Vauxhall top sellers are the new Astra’s and Vectra’s. Both of these cars look very good in the sheet metal, with sculptured ‘edge’ styling being very attractive. 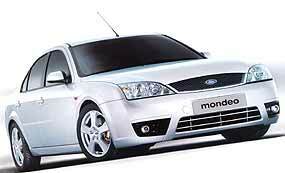 In a similar mode, Ford’s Focus and Mondeo look excellent. As opposed to Thailand, Toyota does not rule the roost over there, and none of the Toyota models we are familiar with here, could be spotted in the UK, despite the names sometimes being the same. The Toyota Corolla in the UK is a stumpy-tailed, wheel at each corner vehicle (like the Mazda3 here), and I actually thought it looked very good. The very small Yaris has different variants, with some looking quite fetching, while others (such as the Yaris Verso) look dreadful. 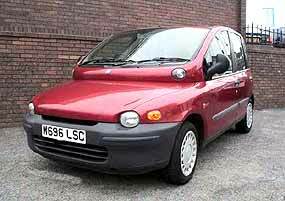 However, the prize for the worst looking car of the post-war era must go to Fiat with its Multipla. A strange box on wheels with frog-eye lights in an obese stomach roll below the windscreen. Completely hideous. 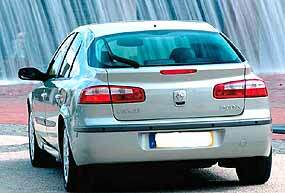 I must add that some of the Renault Megane’s go close too, especially around the rear! Last week, I asked what was the connection between the Peugeot company and Porsche’s 911 series. This was simple. The Porsche was supposed to be designated as the 901 (in fact the early engine cases even have this prefix), but Peugeot had reserved all the three number series with a zero in the middle, so Porsche made their cars into 911’s. By the way, the previous week’s question of the weight of Karl Benz’s first vehicle (without driver), which was 265 kg, was correctly answered first by Dennis P. McGinn of the USS Reuben James, FFG-57. So to this week. Another easy one. Which racing driver used to take a record of his national anthem to race meetings, just in case he won and the organizers didn’t have the music? If 37 billion baht buys belief, then Toyota Motor certainly believes in Thailand. The financial pages of newspapers often give more information than the motoring ones, and this little gem was one of these. 37 billion will increase Toyota’s output from 350,000 units to 550,000 over the next two years. This will also make Thailand the third largest plant in the Toyota empire, after Japan and the USA. The expansion is mainly to increase the production of the pick-ups, though some of the other models such as the Wish, Corolla and Vios, which are also produced here, could be ramped up. A large percentage of the new production will be for export, with official forecasts being for 250,000 units, up from the current 150,000. The Eastern Seaboard of Thailand should also see expansion with a new plant for Nippon Paint (Thailand) which currently has a 34 percent share of the auto paint market. With the increasing production in this country, and Toyota isn’t the only one increasing its numbers, Nippon Paint will need to increase its production to even just maintain its market share. This will apparently cost 1.5 billion baht over the next two years, to double the production. The person who physically attacked their Honda CRV (and many copy-cats unhappy with their purchases), will not have to do this any more to get a response, according to an article in the latest ASEAN Autobiz, written by Senior Editor Montha Panthong. Apparently 12 auto companies have got together and formed the Automotive Quality Diagnostic Committee (AQDC) with Pairoj Sanyadechakul, the secretary-general of the Office of Industrial standards as the chairman. This body has on its panel representatives from the government Office of Consumer Protection (yes there is one in Thailand), the Automotive Institute, the Federation of Thai Industries as well as representative from the 12 automakers which includes Toyota, Honda, Mazda, Nissan and Chevrolet. Complaints about purchased cars are not new, the Office of Consumer Protection has received many complaints (2001 - 220, 2002 - 306, 2003 - 568 and in 2004 - 300). The CRV kicker was not alone! There is now legislation going through to make the manufacturer disprove any complaints, as opposed to the situation up till now, where the consumer has to foot the bill to prove his dissatisfaction, but it stops short of America’s “Lemon Law”. In the US situation, the law states that if a vehicle within the first 18 months (or 18,000 miles) has had the same defect repaired four or five times, or the vehicle has been off the road for repairs totalling 30 days in that period, then it is a “lemon”.